Often the causes of TMD and migraine headaches can be traced to a problem within your mouth. These can range from bite irregularities to the grinding of teeth. We have also found that the majority of migraine cases occur in women. Dr. Matt is specially trained in diagnosing and treating the symptoms of these common ailments. TMD can be temporary or last many years and it’s most common among people between the ages of 20 and 40. Irregularities in the way you move your mouth, chew or bite can cause chronic pain. The muscles and tissues in your mouth are designed to function in a specific way. Chronic pain and problems can occur when a patient has developed irregular habits or when their teeth have simply developed in a way that inhibits the natural motion of their mouth and jaw. This causes undue stress on the surrounding joints and ligaments. 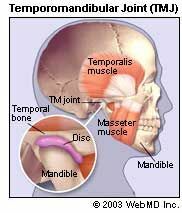 Grinding and Clenching are other common causes of TMD or headache pain. Grinding and clenching are often a subconscious reaction to stress and anxiety. This harmful habit can lead to chronic pain and fracturing of teeth.